Yes summer 2013 has only just passed. Yes the first real of snow of winter has yet to fall and yes Christmas isn’t even here yet, but we can all look forward can’t we? Summer 2014 is what, seven months away, however that shouldn’t stop you looking forward to the longer days, beautiful sunshine and the ability to spend extended periods of time out in your garden. In recent years, the desire to create an exotic garden here in the UK has risen, with many returning from summer breaks in simply stunning exotic locations with an urge to recreate a little bit of paradise experienced on their trip in their own back garden. The first thing you need to do when looking to create an exotic retreat is really get to know your garden. Assess the layout to determine the different areas that will make up your exotic garden. Consider locations for seating, water features and the plants that will all come together to form your own little piece of paradise in your back yard. It is also advisable to find out your soil type as tropical plants do favour rich soil, so you may have to make a few adjustments to encourage your tropical garden to thrive once you’ve introduced a few exotic plants. Decking is a great choice for a (sub) tropical garden and will soon bring memories of the gardens in beautiful sun-kissed locations flooding back to you. Ipe hardwood decking is a popular option and is ideal for creating the perfect area to set up the sun loungers and take in the afternoon summer heat or alternatively set up a barbeque with tables and chairs to welcome in friends and family. Cascading water and various other water features are commonplace in tropical gardens and can be achieved in your own exotic retreat here in the UK. 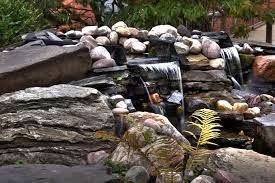 Adding a sense of peace and tranquillity, your water feature could be the focal point of the garden in the form of a large fountain or alternatively a little hidden wonder in a quiet corner where the water makes its way through a rockery into a pool beneath. No matter how you decide to introduce this kind of feature, the sound of water is a must have addition to any exotic garden. The main thing that will separate your exotic garden from others is the use of tropical plants that will, quite surprisingly to some, be able to withstand the colder climate of your UK garden. 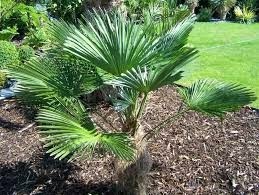 Many exotic plants, such as the Musa Basjoo Banana Plant and Cannas, will require extra special care and attention during the colder months of the year, however some palms are capable of withstanding the cold climate, with the Trachycarpus Fortunei, otherwise known as the Chusan Palm, being a prime example of this. There are of course some exotic plants that you will need to lift and keep in a dry, frost free environment, such as the red abyssinian banana plant, ahead of winter so you can plant again when the weather improved and watch them flourish just as you head out into your garden once again. There are a few finishing touches which are staples of tropical gardens and can really make the space a standout feature of your home. These include the addition of mirrors and ancient artefacts positioned around the garden, in addition to railway sleepers to separate off different areas of your retreat and the use of slate to create pathways into various ‘hidden’ areas of the garden. Whilst you may not have initially thought it possible, an exotic paradise garden can be created here in the UK with careful planning and assistance from experts in the field. It would be great to know if you have a tropical garden and how you achieved it, so leave a comment below with your story. Discalimer: This post was written by blogger and gardening enthusiast Oliver Kyle in partnership with Pumping Solutions; installers of beautiful water features and fountains for all types of garden, from traditional English country garden to exotic paradise retreat.